When investigating a source from HEMA comparing sources can be a way to better understand the material- even if one source is likely wrong. 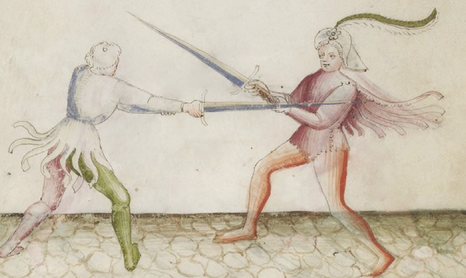 Comparison between like works, or similar works, can better develop our understanding of HEMA. Tyrant Industries recently released the Flower of Battle… twice. Why twice? The MS Ludwig XV 13 and the MS Latin 11269 are both the Flower of Battle but they are different. The works are by, or a copy of, Fiore de Liberi’s system of battle. This is beyond just the use of the longsword, but rather, a comprehensive treatise that includes wrestling, dagger, spear, sword in one and two hands, mounted combat, armored combat, pole-axe and more. There are themes and techniques used throughout the treatise. The MS Ludwig has a preface dedicated to the Duke D’Este, one of the powerful lords of several Northern Italian states including Ferrara and Modena. The Getty is written in a local Italian dialect and the Getty has fairly detailed instructions and artwork. The MS Latin lacks a preface and is written in a rhyming form of Renaissance Latin. The instructions are brief and while they can be telling, on their own they can be difficult to understand. The artwork is also different. While the MS Ludwig has mostly two dimensional art lacking in color except in a few cases, the MS Latin uses color much more and has more perspective in its drawings as well as some finer details. An example of the art from MS Ludwig. Line drawing and use of gold accents. An example of the art from MS Latin. Painted color as well as a a painted ground to provide a sense of perspective. A side by side example of the same play from the two different treatises with a focus on the hands. Throughout the MS Latin the depiction of the hands tends to be more clear than that of the MS Ludwig. 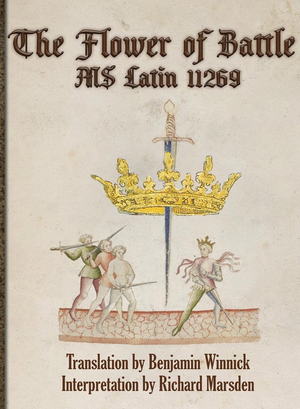 In the Tyrant Industries recent release, The Flower of Battle MS Latin 11269, I was well aware that the Latin was not easy to comprehend even after it was lovingly translated by Benjamin Winnick. On top of that, the art has known, clearly identifiable errors as was noted to me by other Fiore experts I speak directly with or read, such as Michael Chidester, Brian Stokes, Tracy Mellow (layout for our MS Ludwig), Colin Hatcher (translator of our MS Ludwig), Rekuta and Jay Leccesse, whose side by side artistic comparisons making a convincing argument that the MS Latin is a copy of a copy! In short, I’m not the first person to look at the two manuscripts and notice differences. This isn't ground-breaking. However, the differences, errors or otherwise, can help a person better understand their source material and I wish to show how. To help make MS Latin more approachable, I provided my own basic interpretation for each play to go along side Benjamin Winnick’s translation and when able, pointed out differences between the MS Latin and the other surviving works. This in no way makes the MS Latin a treatise to be noted only for where it falls short. The MS Latin has within it artistic choices that give a better sense of depth. Despite its flaws and weaknesses, the MS Latin still has the ability to inform its readers. Coupled with the more complete MS Ludwig- you get quite the pair. An example is a play from of the crossing of the middle of the sword. There are several options from here and the MS Ludwig has one in particular that I believe is best used when your sword is pushed to the outside of the opponent’s making a blade-grab dangerous. 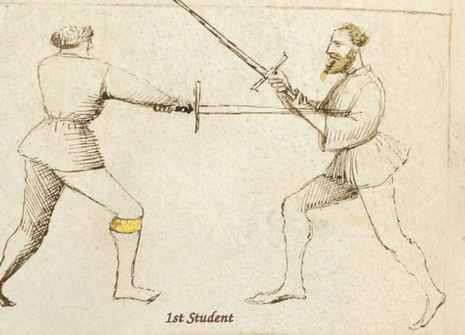 In this case, the student has to pass to try to get to the left of the opponent so they can bring their sword's edge to the arms and then the point into the chest. The MS Ludwig has the following instructions from two plays. I'm also crossed for the long range game, but this time at the middle of the swords. Immediately after making the cross I let my sword drop down to slide fowards and backwards over his hands. Or, if I choose, to pass forward with my right foot and move offline. I can then make a thrust into your chest, as you'll see drawn next. Here you see me completing the play of my teacher. I've made his cover, and then immediately I do what he said to do, that is I strike first to my opponent's arms, and then I continue with a thrust into his chest. I, cleverly holding the sword now in the middle of the sword, will certainly strike your right arm as in the bind, although this time might be much too short for showing these things as much as you wish. I strike you just as the previous master said before, who holds back the blade in the bind by means of which he may be able to deceive. Not easy to understand, however, the art shows a greater sense of perspective. Notice the feet of the student and compare them to the feet from the student above. This turn of the feet in my own studies helped me better perform this play and get a much better sense of how the play moves around the opponent rather than right into them. The instructions from the MS Ludwig are robust, but the artistic depiction is not entirely satisfying given its 2 dimensional nature. Meanwhile, while the MS Latin might be hard to understand, but the artwork can help give a better sense to a technique. This is why we released the MS Latin with comparisons to other sources and my own interpretation. Additionally, the art had suffered some damage from ghost-images and Henry Snider was able to clean that up as well as other severe damage while keeping minor imperfections of age to keep the authentic look of the book intact. Rapier is a weapon blessed with comparative sources. In Fiore’s day in the early 15th century, the making of a book was a costly ordeal that quite literally could involve the use of gold and silver and be the prerogative of nobles. Things had changed dramatically by the 17th century with the printing press becoming fairly ubiquitous. Creating a book was cheaper which led to a competitive market. In terms of rapier fencing this is enormously beneficial. While we have, generally speaking, only a handful of sources when trying to understand Fiore de Liberi, there is a lot of rapier sources and they can be used to learn from one another as well as detect trends in fencing. Example, Giganti and Capo Ferro wrote roughly around the same time, the early 17th century, and both detail the lunge. Looking at the two images comparisons can be made. Both are attempting to do the same thing and presumably, the artist is depicting an ideal lunge. 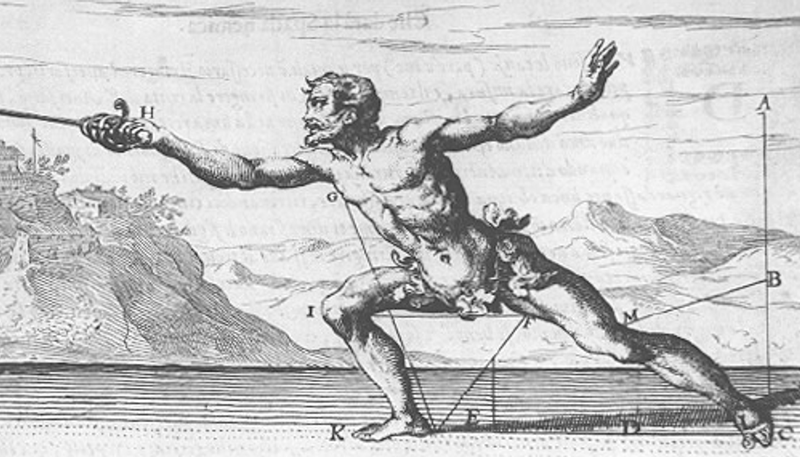 The above is Giganti's depiction of the lunge. Tom Leoni's translation breaks the lunge apart into various steps. If interested you can pick the book up, I highly suggest it! In short though, the arm extends, the body leans and the foot steps- but this is done as a single motion. Capo Ferro's depiction of the lunge is not the same- though the two are not so divorced from one another that they aren't showing what is clearly the same concept. Capo Ferro's instructions are also different than that of Giganti and he details how the lunge comes from different guards and is aimed at different targets. By reading all of Giganti and Capo Ferro more can be learned, from both, about how the lunge was performed and the differences are, to me at least, largely stylistic. Salvator Fabris was also an early 17th century rapier master and his work was valued in his lifetime and beyond. One of the reasons I think this was so, was because Fabris compares sources within his material doing the work for you. 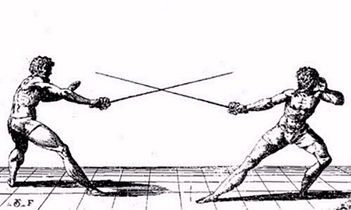 This is Fabris' depiction of the 3rd rapier guard and how it was commonly employed. He also does not like it and explains why the guard has weaknesses. Fabris shows this as a two-fold lesson. First, to indicate what was to be commonly expected from others. Second, to explain how the guard was not in his view a perfect guard. Fabris after showing the 3rd guard gives his version of it and states how to form it and why it is better than the prior guard. In this, Fabris is using the method of comparing two things to better understand both. In this case, the weakness of the one and the strength of the other. Another way to compare sources is to not compare contemporaries, but to look at how a system changes over time. In the case of longsword, early KDF opposed to the 16th century Meyer, and in rapier, early 17th century material, such as Giganti, compared to late 17th century material such as L’Ange. The Zornhau is, as German longsword goes, a fairly bread and butter technique. 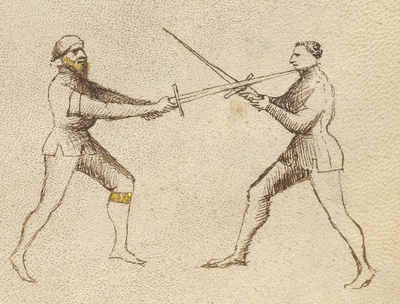 How it is described and depicted from the 15th compared to the 16th century shows that the art of longsword did not stay the same. Just as in modern martial arts today, masters tinker and tweak, add and take away, and each successive master has altered what he was taught. Debate can be had as to if this continual tinkering leads to unrealistic results, but for the purpose of learning, just a side by side helps see and perhaps understand both sources better. Who strikes at you above, the Wrath stroke threatens him with the point. If he becomes aware of it, take it away above without fear. Be strong against it; wind, thrust. If he sees that, take it down. Note this: strike, thrust, posture, soft or hard, Instantly, and Before and After. Your War should not be in haste. Glosses from German masters helps explain this cryptic verse, but, looking just at Meyer a comparison between the ‘ancient’ and the ‘modern’ (in their terms) can be seen. The Wrath Guard, from which the cut takes its name, that is the Wrath Cut, named for its wrathful comportment; halfway through the cut into the Longpoint; and at the end into the Change. If you draw the stroke back up from there with the long edge, then you again go through three postures, that is in the beginning the Side Guard, in the middle the Longpoint again,and in the end up into the Unicorn. If you slash through one of these lines, whatever side it is from, then you come from the Change through the Longpoint into the Wrath Guard. The Wrath Cut is a diagonal cut from your right shoulder at your opponent's left ear or through his face and chest, diagonally through as shown by the two crossed lines that pass through the vertical line. 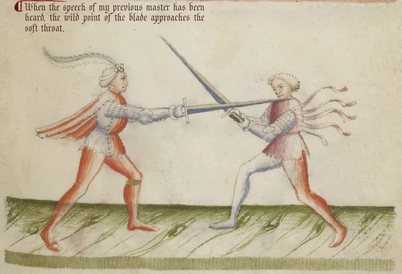 This is the strongest of all cuts, and embodies all the might and virility of the combatant against his opponent in duelling and combat; therefore it is also called the Strife Cut [Streithauw] or Father Stroke [Vatterstreich] by the combat masters of old. A true combatant doesn't parry, but when the opponent cuts, then he cuts too; when the opponent steps, then he steps too; when the opponent thrusts, then he thrusts too. Concerning the first way, you need to know that the High Cut suppresses all other cuts downward from above, namely the Wrath, Middle or Horizontal, and Low Cut, in this manner: spring out from his cut, and at the same time cut strongly at his cut as it comes in, so that if you hit correctly, you weaken his weapon so much that you can well cut the second one at his body before he fully recovers. Well, it goes on. While someone studying early KDF may not like the context of Meyer, there is something perhaps to be learned simply in comparing instructions in search of more clarity, and someone who is trying to learn Meyer would benefit themselves by looking back to the ‘combat masters of old’ as Meyer put it. German material is not my main area of focus, but I'm conversant and even a casual glance between two centuries aids me in becoming more conversant. When looking at L'Ange, a mid 17th century rapier master, and comparing him to the likes of Capo Ferro, Giganti, and Fabris- differences can be seen, as well as what seems to be real-world commentary on techniques. He goes on to explain why he does not like them and there is a sense that perhaps the voids were better performed in the salle then on the street. Further research into sources can help understand the context all the better whereas just looking at one source can be limiting. These differences continue and in even later 17th century material sharper divides between then and the past can be seen. 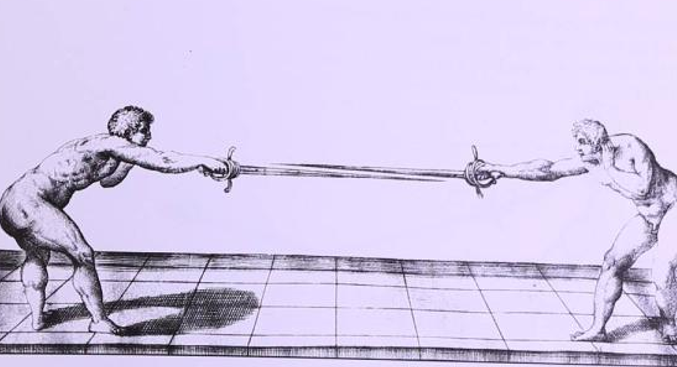 Early rapier treatises strongly advise not conducting parries, but rather fighting in single-time where the parry and counter-attack (or attack) is one and the same. This is not so much a hard and fast rule when looking at late 17th century sources which indicate parrying in two-time, while backing up, can be devilishly effective. One of the basic ways humans think is in terms of, how is (X) and (Y) similar and different. It’s how we learned our letters, sounds, colors and shapes. The same can be applied to HEMA. Looking at contemporary sources and even sources far apart on the same subject can be used to deepen understanding. What is the same and why might that be? What is different and why might that be? Is something wrong, and if so, what does that tell about what is right? Are two things right even though they get there different ways? The questions in of themselves are not exactly ground-breaking, but, people who only read strictly from one source might not be able to answer the above because they have nothing to compare their source with. In my own teaching of HEMA, I use Fiore and Giganti quite heavily, however, I am versed in many other masters and that has helped me understand my chosen source material. Including its meaning, context and strengths and weaknesses. While you can come to your own conclusions using just one source, using numerous sources to better understand is exactly what HEMA is all about! What sources do you compare and contrast and what have you discovered? Does your source lack in some area or excel in others? What is the fundamental difference over time between your source and something newer or older? When comparing sources is there limitations? What is true and what is opinion? Well, good news! If you want to do some comparing and contrasting on the cheap- you can. Wiktenauer has plenty of it done already for you and doesn't cost you a dime. However, if you'd like top support Tyrant Industries latest work on Fiore, the MS Latin, which has cleaned up art, a translation, my interpretation and comparisons- then by all means! Want some of the sources above? Remember, these are all HEMA guys who benefit from your patronage.